Even though melasma is a common skin disorder, melasma treatments have become a increasingly controversial. Melasma occurs when the color producing cells (melanocytes) in your skin produce too much pigment. 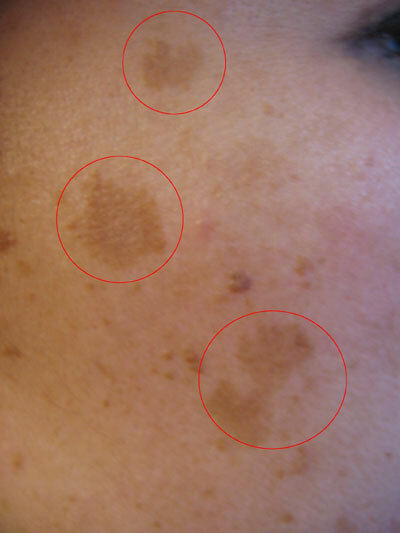 Melasma will reveal itself as dark brown or grey patches on your skin. Most people who get melasma will find these patches on their forehead, cheeks, and upper lip. There are two well known triggers of malasma; UV exposure and hormone fluctuations. Women are more likely to get melasma because the hormone changes caused by pregnancy and oral contraception can trigger melasma. If you have melasma your first priority should be to protect yourself from further UV exposure. Dermatologist recommend that patients with melasma wear sunscreen each day and use hats and other protective clothing when out in the sun. Reducing your UV exposure should prevent your melasma from becoming worse. The most commonly prescribed medication to treat the symptoms of melasma is hydroquinone. Hydroquinone is a topical skin lightener that can be prescribed by a physician or bought over the counter in a less concentrated forms. Hydroquinone will make your skin sensitive to the sun so it is critical that users take special care to protect themselves from UV exposure. Hydroquinone has been a controversial drug and is banned in Europe and Japan. These bans were precipitated by animal studies which suggested that hydroquinone might be toxic and is a possible carcinogen. Many physicians argue that in the drug’s 50 year history it has been correlated with an extremely low incidence of complication and it is the most effective skin lightener currently available. If you are concerned about the possible side effects of hydroquinone you can choose an all natural alternative. All natural products containing kojic acid, Arbutin, bearberry and mulberry have been successful in lightening skin. Some people find success with home remedies that use common ingredients like lemon, honey and milk. Melasma can be an embarrassing, ongoing problem for many women. It is up to each individual to educate themselves on the risks and effectiveness of melasma treatments. The most important step any women can take if she is struggling with melasma is to protect herself from the sun and choose a skin lightening regime that she feel comfortable with.